DISCLAIMER: WE RECEIVED A PAWPALS WITH ANNIE! BOX IN EXCHANGE FOR OUR HONEST REVIEW. ALL OPINIONS ARE 100% TRUE AND OUR OWN, AND WE LOVE hELPING YOU FIND YOUR PERFECT PRODUCTS! It’s back! You may remember our PawPals With Annie! reviews from May and June and are wondering what’s in the newest boxes. Well, in celebration of the holiday season, we’ll be highlighting multiple subscription boxes and the brands within them so that you can pick the gifts that are right for the pups in your life! What’s different about the PawPals With Annie! box? Well, for one, it no longer comes in a box! 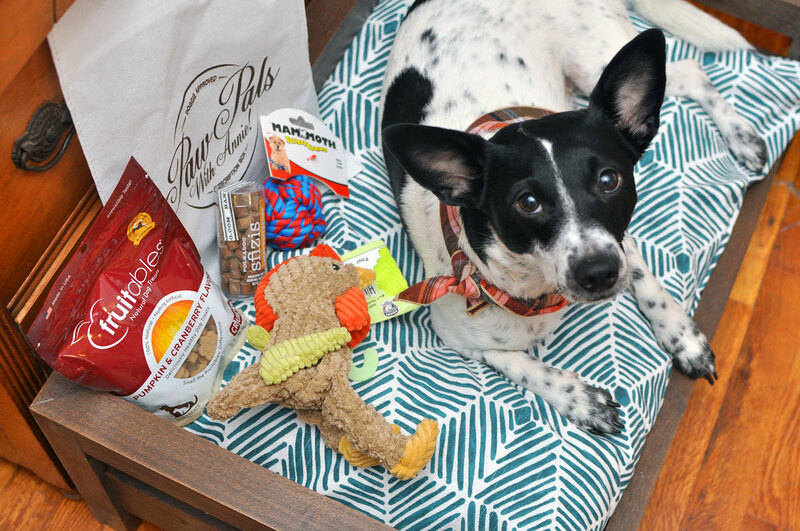 Each month’s subscription now arrives in an eco-friendly bag and focuses on helping you save money on “fine quality products for the premium pup.” Although each shipment may contain limited items, you know that each product is top notch. Keep reading to see what we received in this November’s “Pup Pie” shipment and learn how to save 10% on your own subscription! These treats are made from only three ingredients (locally sourced duck liver, potato flour, and honey) and would be absolutely perfect for training sessions. The cute packaging makes these perfect for gifting or even for keeping on your counter when your parents visit during the holidays (Does anyone else get paranoid about what your family members think about your abode?). I also love that the name Sfizi means “to satisfy a craving” — what a fun touch! Henry loves Fruitables, and he’s yet to try this kind! The flavor sounds delicious and each treat only has eight calories. I also love that the ingredients list is pretty short and there is no wheat, corn, soy, or artificial ingredients. Also a plus: a resealable package! Henry has had several rope toys in his time, and many of them use a very hard rope. Not this Flossy Chew Ball — this one is surprisingly soft! I love that it will roll quietly around my apartment and that it’s a good size for Henry: not too small, not too large. Plus, the packaging says that this toy is good for dental health. Sounds great! We love Willowear Pet Bandanas! 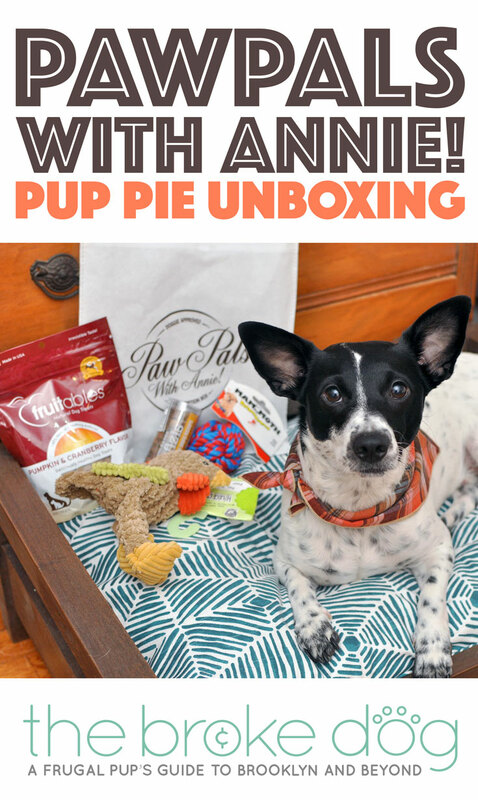 It’s one of our favorite bandana brands, and we discovered it thanks to the adorable red plaid bandana that came in our June Paw Pals With Annie box. These bandanas come in cute patterns and always fit Henry perfectly without annoying bulk or bunching. This one was perfectly festive for Thanksgiving, and Henry looked fabulous while watching us chow down. PawPals With Annie! is the only dog subscription box to deliver its goodies in a tote bag! It’s reusable with the company’s logo printed large and beautifully. I did accidentally snip it when I was cutting open the envelope it came in — just be careful and you’ll have better luck than klutzy me! Henry and I thought that this month’s PawPals With Annie! products were great! He wore his Willowear bandana almost the entire Thanksgiving weekend and I received lots of compliments on the Huggle Hounds Turkey Toy. I think the box had ample variety — two toys, two treats, and an accessory — and loved that it contained seasonal Thanksgiving-themed items to help us get in the spirit. I also applaud PawPals With Annie! 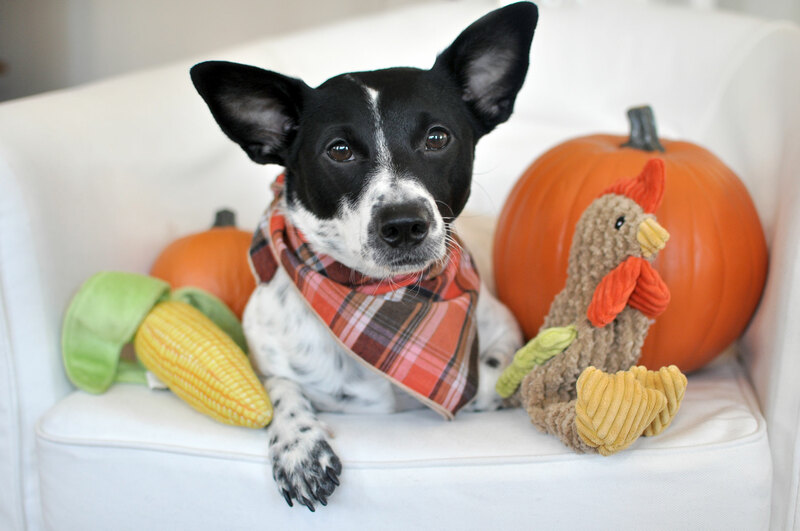 for including two items — the Willowear bandana and Polka Dog Bakery treats — from small businesses. If I were to tweak the box, I would include a chew like a pig’s ear or bully stick, but I absolutely didn’t miss it because I was too busy melting over Henry in his new bandana! PawPals With Annie! has three plan options starting at $20/month. This specific box was worth about $50 and would ship for $10, but you can buy a comparable box for only $40 with free shipping! Plus, to save an additional 10% off that, use code BROKEDOG at checkout. Buy your own PawPals With Annie! box at their website, and check them out on Instagram and Facebook!